The launch of a cut-rate unlimited $39-a-month mobile plan offered by upstart Voyager Mobile was marred Tuesday by what the company claims is "a malicious network attack to its primary website." The company now says it's postponing the launch of its budget plan until an unspecified date. The company had generated buzz for its low prices. 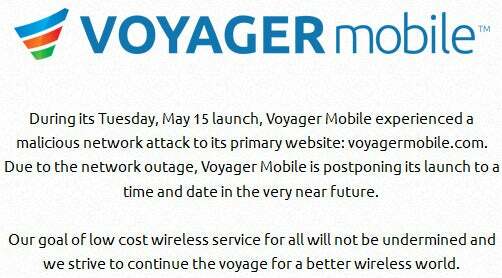 Voyager Mobile had planned to offer a contract-free $19 per month that included unlimited calls and texts. A second plan included a $39 plan that included unlimited calls, text and 3G/4G data. Voyager Mobile had planned to piggyback its service on Sprint's network and operate as a mobile virtual network operator (MNVO). Voyager Mobile would also resell some of the most popular Android smartphones on Sprint such as the Motorola Photon 4G, Samsung Galaxy Epic 4G Touch, and some yet-unnamed Windows Phone 7 devices, USB dongles and mobile hotspots. The company was meant to unveil its website on Tuesday at 6AM ET. Voyager declined to comment when asked about the alleged attack. It's also unclear why any group or individual would target this company.